The following document details the process of submitting information about yourself and your visit to the United Kingdom using the form on the appropriate computers in our tourist information offices. 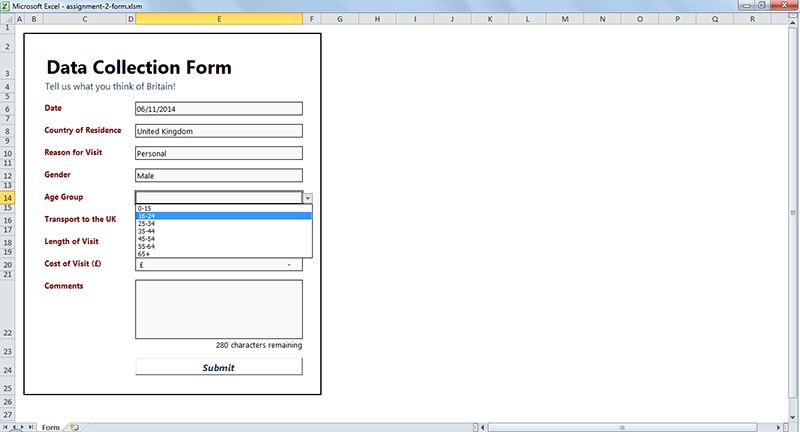 This form is created using Microsoft Excel, and uses a macro to submit the data to a separate table. We can then collect the information people have submitted from around the country, and generate a wide variety of statistical information about tourism in the UK. The information you submit is anonymous, and we respect your right to leave any of the form fields blank if you feel the information is too personal. How is the information stored? The information you submit is stored in a secure Excel spreadsheet, and is collected daily by staff after the office closes. This means that the information is kept on the public computer for no more than a day, and is password-protected. Is the form submission anonymous? We only collect the information that you enter in the form, including the date that you submitted the form. This means that we don't know know your name, address or specific personal details. If you feel that any of the fields are too personal, you may decide to not enter any information, although we do encourage you to do so. Why is the information being collected? We collect the information in order to gain knowledge of the tourists who use our offices. This means that we can create more helpful resources such as guides and maps focused towards those most likely to visit us. By filling out the form, you are helping us to decide what material to create, and if you choose to visit in the future, you're helping yourself. The form has been designed to be as simple to use as possible. 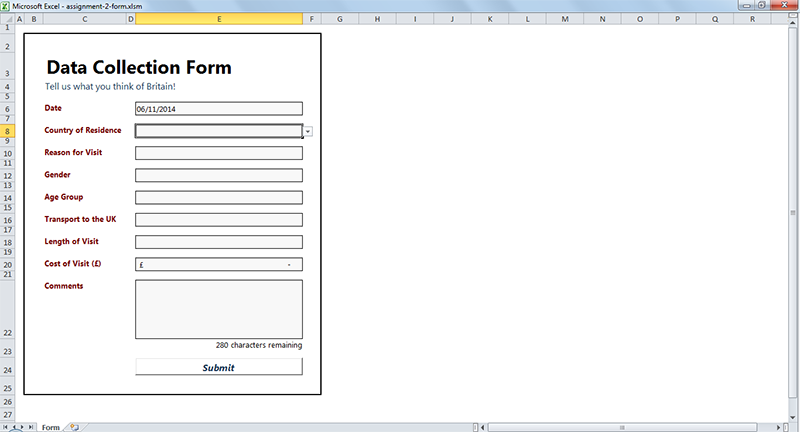 A screenshot is shown below of the form as it should appear before being filled out. The form without any data entered. Image by myself; see the license. The first field of the form, the Date field, should already be filled in with the current date. If this is not the case, please tell a member of staff. This cell does not require any input from you. The second field requires you to enter a home country. The easiest way to do this without causing trouble is by clicking the downward arrow to the right of the cell when it is selected. This will show a list of nations available for selection. If your own is not shown, please select Rest of World, and tell a member of staff. Continue the process of selecting the most appropriate option from the lists provided in each field. The last two fields, Cost of Visit (£) and Comments require you to instead type an answer. The images below may help to illustrate the process. The process of selecting an age group from the list. Once you have completed the form with your information and are content with the data, press the submit button. The page may flicker for a short period of time, but a window will appear afterwards confirming that the data has been submitted if everything has worked. If this window does not appear, please tell a member of staff in the tourist office. 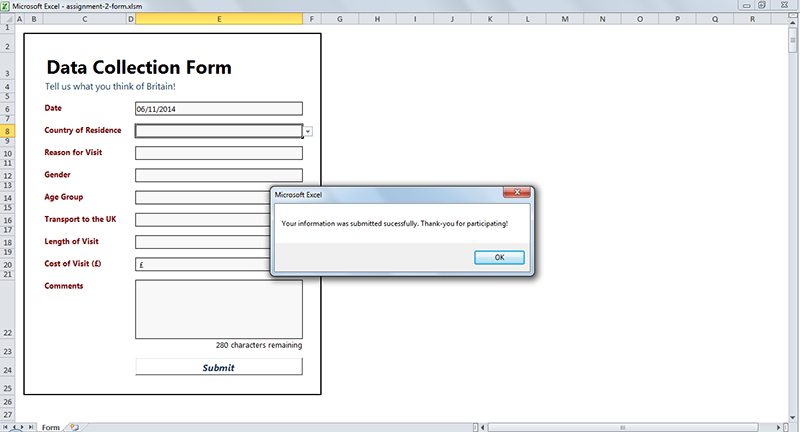 The message shown once the form has been successfully submitted, and the information recorded. If the window has appeared, as shown above, you may click OK. The form has been submitted, and you may leave the computer for the next person.